Review by AllTheBestFights.com: 2016-12-10, pretty good fight between Max Holloway and Anthony Pettis: it gets three stars (UFC Performance of the Night). Max Holloway entered this fight with a pro mma record of 16-3-0 (50% finishing rate) and he is ranked as the No.4 featherweight in the world (currently the #1 in this division is Jose Aldo). He suffered two consecutive defeats in 2013, against Dennis Bermudez and #1 Conor McGregor (=McGregor vs Holloway), but then he has won nine bouts beating Jeremy Stephens (=Holloway vs Stephens) and Ricardo Lamas in his last two (=Holloway vs Lamas). His opponent, the black belt in tae-kwon-do and former Ufc Lw champion Anthony Pettis, has a record of 19-5-0 (84% finishing rate) and he entered as the No.3 in the same weight class but he lost three out of his last four bouts: against Rafael dos Anjos (=Pettis vs dos Anjos), Eddie Alvarez (=Pettis vs Alvarez) and Edson Barboza (=Pettis vs Barboza). ‘Showtime’ Pettis come back to win in 2016 defeating Charles Oliveira (=Pettis vs Oliveira). 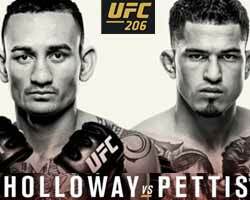 Holloway vs Pettis, main event of UFC 206, is valid for the interim Ufc featherweight title (but just for Holloway since Pettis weighed three pounds over the Fw limit); on the original fight card the main event was Daniel Cormier vs Anthony Johnson but DC pulled out due to injury. Watch the video and rate this fight!